Reduce. Reuse. Recycle. No, it is not just the motto for Bob the Builder; it should be all of our motto's! I see more and more people recycling which is awesome. But its even better if you can Reuse something. Over the years, many of us seem to build up quite a collection of t-shirts. For you maybe they are from your college or maybe you have a lot of concert shirts. 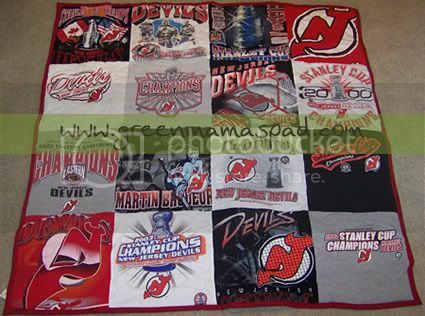 For me, I had a ton of New Jersey Devils (NHL) shirts. Most of them were probably purchased in my late teens and early twenties. When I got married back in 2003 and we moved into our house, they got packed away in a box which has just sat in the basement. I actually was holding onto them in hopes of making a blanket or quilt out of them someday, but I have absolutely no crafting or sewing abilities whatsoever. Then a few weeks ago I came across The Campus Quilt Company. I cannot even begin to tell you how excited I was to find them. I love that you can REUSE your old shirts to make something that will last forever instead of just sending them off to a landfill. 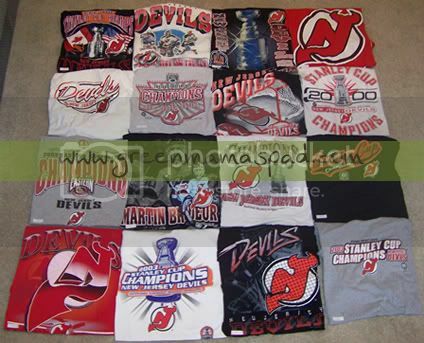 Custom T-Shirt Quilts made from your t-shirts, sweatshirts, ties, socks, hats, baby outfits, and any other memorable fabric. If you are like most active people, you have a pile of treasured old t-shirts you just can't bear to throw away. Campus Quilt is dedicated to turning your old clothes into lasting memories in the form of fun and functional t-shirt quilts. The process for creating my quilt was quite fun. The first step is to determine the size you want. Each "square is 15 inches and you can get a quilt as small as 9 squares (Lap Quilt) or as large as 49 squares (King Size). Once you place your order, you will be mailed out your order packet. In this packet you will find an order form, layout instructions, swatches for quilt backing (which you must return), stickers to number your shirts and a pre-paid UPS mailing label to ship your shirts and order back. So I went into the basement and dug out my box of shirts. I threw them in the wash because hey, they've been in my basement for 6 years! Then the fun began. The Campus Quilt Company was nice enough to let me design a 16 square quilt to review. As it turns out, I had the perfect amount of shirts for it. I cleaned up my living room floor and laid them out in the order I wanted. I even folded them into 15 inch squares, because I am crazy like that. When I was happy with the order of my shirts, I numbered them and snapped a picture, which I included with my order form just as a backup. then its time to pick your finishing touches. 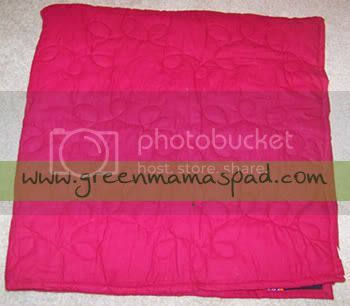 The price of the quilt includes cotton backing which comes in a variety of colors. I decided to go with red flannel which costs extra, but I love how soft flannel is. Some of the other extras you can get are sashing and embroidery. Then I carefully placed my shirts, in order, into the bag provided, along with my form, picture and swatches and dropped it off at Staples for UPS pickup. Turn around on quilts is about 2 to 4 weeks. Last week my finished quilt arrived on my doorstep and we were so excited. I tore open that box immediately. I could not have been any happier with the end result. Most of the designs on my shirts were larger than 15 inches so I was a little nervous about how they would look. The Campus Quilt Company did a great job of getting the important parts into each square. I also love the stitching, which is on not just the back but on the front of the shirts. It really looks fantastic and I love it. A custom t-shirt quilt from The Campus Quilt Company would make a perfect holiday gift. And you don't have to use just t-shirts, you can even use your favorite baby clothes. They even make t-shirt pillows so you can get a pillow to match your quilt! Be sure to get your orders in early before the holiday rush starts! The Campus Quilt Company is very generously awarding one Green Mama's Pad reader with a $150 gift card to use towards their very own custom quilt. Visit The Campus Quilt Company and take a look around. Come back and tell me what kind of quilt you would buy with your gift card if you won. Make sure you tell me what kind of shirts/clothing items you will be sending, the size quilt and any extras you might want. 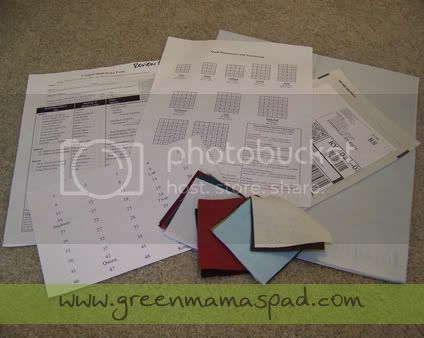 - Follow GreenMamasPad Twitter and and tweet this giveaway. You can tweet once daily. Leave link to tweet in comment. - Become a fan of The Campus Quilt Company on Facebook. This giveaway is open to US Residents 18+ only and will end on Friday, October 30th at 11:59pm EST. One winner will be chosen at random using Random.org. Winner has 48 hours to claim his/her prize otherwise a new winner will be picked. You must leave your e-mail address in all of your comment(s) so I can contact you. I will not share your e-mail address with anyone, it will strictly be used to notify you if you win. Good luck! Please note that the opinions and views expressed in this review are my own and based on my personal experience with the company and product. You may encounter a different experience with this company or their products than I did. I did receive a free product for this review. I hate being first, but I would choose the 36 square quilt. I would send in my tee shirts from high school, like prom, volleyball, seniors, etc. I am a fan of CQ on facebook. I'd get a 9 sq t-shirt quilt with sashing. I thought I'd want a baby quilt but with the new baby coming I need to keep the clothes for him. I think I'd get a 9 Squares - Lap T-Shirt Quilt with a photo square of a family photo. I think I would use the kids school T shirts as the fabric. I want a 9 Square Wee Quilt with my son's baby clothes! So cute! My DH has one of these quilts with his old college t-shirts and they are great. They has super good customer service too. I would do the 9 square wee quilt and I would add their pacifiers and lovies. I'm Campus Quilts fan on Facebook. I subscribe via email with the same email address that is in my official Blogger profile. and add my moms pictures she does on it! Became a Fan of Campus Quilt Co on Facebook! I have a lot of old U2 shirts so I'd send those in and have them made into a 9 sq t-shirt quilt with sashing. I would choose to make a T-shirt quilt and I would use clothing from my husband and kids as well as my two grandsons. What a fabulous family heirloom. I'd do a 9 square quilt, but I don't have many tees so I'd really have to think about what I'd use. I think I would like to get a wee quilt with some of my little mans baby clothes that were special to us. Probably the 9 square one. Love how cute that is! I would choose the 12 Squares - Picnic T-Shirt Quilt and I would send them my old blue jeans shirts. I would get the 12 square with my dd and dh's sports uniforms. These are awesome! I would choose the 36 square quilt and use some of the many t-shirts my son has collected over the years. I would love the 36 square quilt so it would fit on my bed. I would love to save some of those old tees with holes and that I can no wear! This is such a great idea for gifts and I would love to have one. I'd get a t-shirt quilt with all of our old concert tees. I would use the gift card for a baby clothes quilt. I would get the photo quilt! Wow what a wonderful unique product! Love it! I would choose the 9 Square Wee Quilt and send in some of my son's old baby outfits. I subscribe to your email updates. (ahappyhippy1[at]gmail[dot]com. I'd get a 12 Square - Picnic T-Shirt Quilt. We're always heading out to outdoor festivals and such and this would be such fun to take along! OMG! It turned out great! I'd get the 9 Squares Lap T-shirt Quilt and use it for my teenage daughter's school and activity shirts. Thanks. I would choose a 8 square wee quilt and I would use my son's baby clothes that I don't know what to do with!! I would get the picnic sized quilt with some of my boys favorite t-shirts. I want a 9 Square Wee Quilt with my 3 son's baby clothes! I'm a campus quilt facebook fan. I would get the 20 square Couch Quilt size 6'3" X 5'. I would make it from t-shirts that we no longer use. I think I would pick the Denim backing. I'd definetly get a wee quilt, My baby girl is 8 months and I need a way to keep some of her beautiful baby clothes. I would like a Queen Sized Tshirt quilt from my husband's old sport shirts. I would get the 9 Squares - Lap T-Shirt Quilt. I am not exactly sure the shirts I would choose. Probably a mixture of my husband's shirts with my shirts and I'd save the quilt for my son, in case something ever happened to us. I would get my son's name embroidered on it as well. Thank you for the giveaway! I am a fan of The Campus Quilt Company on Facebook.